Raspberry Pi Zero WH ? | Life, The Universe and ... Everything! I was quite glad when it was announce that Cytron was the non-industrial-use local distributor for the Raspberry Pi series ... and they carried the PI Zero and Pi Zero W. These are the low cost models announced at USD5/MYR20 (Pi Zero) and USD10/MYR40 (Pi Zero W -- W stands for WiFi-capable) respectively. With the dip in the Malaysian Ringgit's value recently, they are even cheaper here than in t=the US and UK. One of the great things with the Pi Zero series is not just that they're small and cheap, but they're also small and cheap enough to be used as a controller for other electronics on a PCB, by simply making a socket on the PCB for the Pi Zero to plug into. They use standard 2.54mm spacing for their pins, so they're easy to interface with ... just a 20x2 row of standard female or male headers and you're done. People have also soldered right-angled header pins to the Pi Zero W, so the Pi sits on it's side. It's simple and versatile in this way. This is of course, not what its intended purpose was ... it was meant as an answer to a dare to produce a "computer" cheap enough that anybody could own, especially those in the education sector. Hence you're not expected to need to buy more than one unit. For those wanting to embed a Pi controller into their own design, there is the Pi Compute Module, with a roughly similar form factor, but with embedded storage rather than a fiddly SD card, and no ethernet support. It uses a SODIMM (laptop memory) style socket. They've guaranteed availability for a number of years, which is the kind of thing people making a product out of it depend on. However, for DIY and hobby projects, the Compute Module simply isn't suitable ... the need to have WiFi or ethernet implemented on your own PCB, and also the fact the the SODIMM connector is a surfaced-mount component (not as easy to solder as through-hole components) puts it out of the reach of most DIY hobbyist and makers. In this territory, the Pi Zero W reigns supreme. And while Arduino with a WiFi shield may cost a bit less, the software environment is nowhere near what you get with the Linux OS on the Pi Zero -- and if that's your thing, then the Pi Zero W is the way to go. But what's the point, if you can only ever own one of it? I have many project ideas for a Pi Zero W. You would think that the manufacturing shortage would have been resolved by now, a year and a half after its launch. So why still limit it to one per person? It turns out, the real issue is the price ... at USD5 (MYR20) and USD10 (MYR40), it is simply not profitable for the distributors to carry them. So in a way, the goal of being able to build a Pi at that price point was achieved, but not the goal of being able to sell a Pi at that price point. They can't raise the price of the Pi Zero and Pi Zero W, as that would be admitting that the original goal can't be achieved. This probably explains why the bigger distributors such as RS and Element14/Farnell don't carry the Pi Zero series ... they only sell the more powerful Pis, which are more expensive and give them a better profit margin. In that sense, Cytron, who cater more for the hobbyist and education market, should be commended for distributing them in Malaysia, as they are doing more of a public service in doing so. So what's someone like me, who wants more Pi Zero W's to do? There are only so many friends and relatives names I can use to order them. Now there is a solution for this ... introducing ... the Pi Zero WH ! This is exactly same Pi Zero W but with header pins soldered on. The header pins probably cost only MYR0.20, and they're adding MRY20 to the price, but that's not the point. It's now a "value-added" Pi Zero W, which means they can charge whatever price they want to, without disturbing the original project goals. But most importantly, since they can finally make some profit selling these, there is no longer a "1 unit per person limit" ... I can order as many as a like. So my project ideas are still a go! 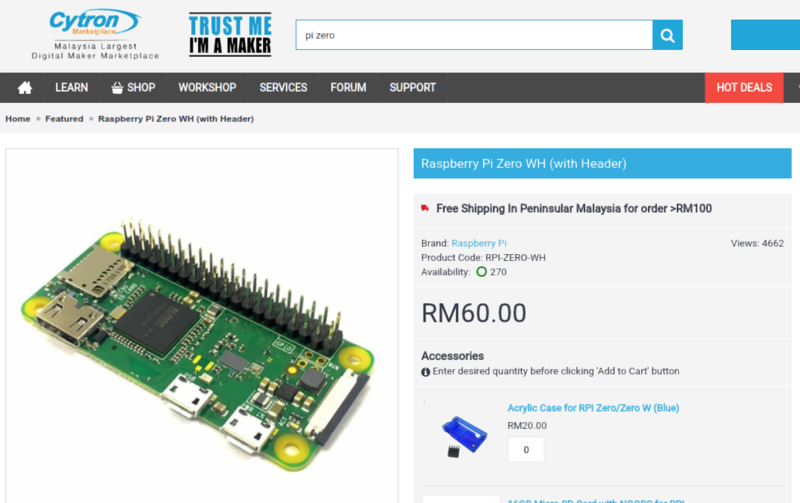 At MYR60 it is still cheaper than it's bigger brother the Pi 3 B+ at MYR165. So I don't mind paying the premium. The only irritating thing is that I prefer to have the pins soldered on the bottom, so that the Pi sits right-side-up. With the pins pre-soldered at the top, not only would it mean the Pi sits upside down when plugged into another circuit board, but it also means the circuit boards pins would need to be reversed from the "standard" layout. I should ask Cytron if they'd be willing to sell me a Pi Zero WH (with Header) but with the header unsoldered. I'll happily pay the MYR60 price, I just want the flexibility of soldering the header pins on the bottom, or using right-angled header pins. I don't know how hard it will be for people in other countries to get their Pi Zero W's without header pins in quantity ... that might be an important point to consider, regarding which way I should expect orientate the Pi Zero W for my future projects.